↑ "Nissan officially unveils new Navara". สืบค้นเมื่อ 15 July 2015. ↑ "Nissan Posts Teaser for New Pickup on Instagram – News – Car and Driver - Car and Driver Blog". สืบค้นเมื่อ 15 July 2015. ↑ Brandon Turkus. 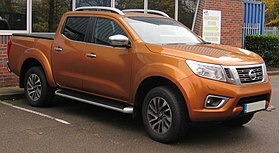 "Nissan reveals NP300 Navara pickup, is it the next Frontier? [w/videos] [UPDATE]". Autoblog. สืบค้นเมื่อ 15 July 2015. ↑ "2016 Nissan Navara unveiled". ↑ "New Mercedes X-Class arrives and the 'premium pick-up' is born". Auto Express. สืบค้นเมื่อ 27 October 2016. หน้านี้แก้ไขล่าสุดเมื่อวันที่ 24 กุมภาพันธ์ 2562 เวลา 02:04 น.